Today we're featuring the Albert Junior Hockey League's logo map. That may seem random, but actually there's a good reason for it. Starting tomorrow, we'll begin the AJHL mini-tournament of logos. The league has 16 teams, one of which you'll have to scroll way up for on the map. The Fort McMurray Oil Barons must have lots of long bus rides to endure. 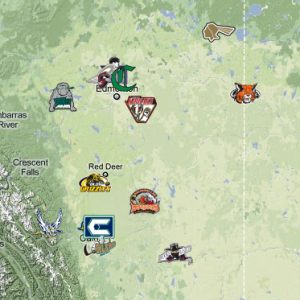 And one other note on this map, the Lloydminster Bobcats don't actually play in Alberta — their arena is in Saskatchewan! So why an AJHL tournament? Okay, I don't have a reason for that. That was pretty much just random. But at some point we'll be getting to all of the junior leagues. Some of them have pretty awesome logos. Of course some do not. Anyway, enjoy the AJHL map. What league should we do next? I'm thinking the Central Hockey League, which recently merged with the IHL. If you have suggestions, the comment box is just below.